Gorkha Janmukti Morcha president and the Gorkhaland Territorial Adminitration (GTA) chief Bimal Gurung on Thursday revealed his plan of visiting Gorkha National Liberation Front president Subash Ghisingh, who is presently admitted at a hospital in Delhi. 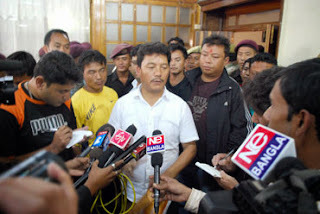 Gurung was an old lieutenant of Ghisingh in GNLF – in fact Ghisingh is considered to be Gurung’s mentor - before the former charted out his own course, forming the GJM on October 7, 2007 and bringing about the downfall of Ghisingh in hill politics. admitted at the Delhi hospital after Diwali. Gurung’s decision to visit Ghisingh comes in the wake of an appeal by the People’s Forum, a hill-based social organization, on Tuesday. The forum had cited Ghisingh’s contribution to the hills as a politician and also urged Gurung to meet the GNLF leader on humanitarian grounds. Speaking on the sidelines of a programme held to induct GNLF supporters into his party, the GJM chief said, “I will go and meet Ghisingh on humanitarian grounds. I will also seek an update on his health condition and see how I may be able to help him.” Earlier too, Gurung had said he would visit the GNLF leader and extend support, if necessary. On Thursday, 40 houses of GNLF supporters from the Chainpure area of Bijanbari block joined the GJM. Asked about his proposed meeting with the Prime Minister and the Defence Minister, Gurung refused to elaborate. “All I will say now is that I will be meeting the Prime Minister and the Defence Minister during my six-day stay in Delhi. A few party leaders will also be accompanying me,” he said.